Activists held pro-voting-rights placards outside the Supreme Court on Feb. 27, 2013, in Washington, D.C., as the court prepared to hear Shelby County v. Holder. Editor's note: On the one-year anniversary of the Supreme Court's decision in Shelby County, Ala. v. Holder, which gutted key provisions of the Voting Rights Act, Sherrilyn A. Ifill will testify before the Senate Judiciary Committee and urge Congress to pass the Voting Rights Amendment Act, S. 1945. Below is a portion of Ifill's testimony to the committee. The Voting Rights Act of 1965 is universally recognized as the most successful piece of legislation to emerge from the civil rights movement. 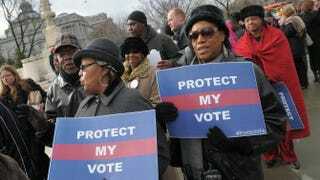 The Voting Rights Act has withstood constitutional attack in every instance except the last. In Shelby County v. Holder—a decision handed down one year ago today—the Supreme Court ruled unconstitutional the provision of the act by which Congress determined which states and jurisdictions are subject to preclearance. The court reached that decision despite an overwhelming record amassed by this committee and its counterpart in the House demonstrating the existence of contemporary voting discrimination. Some have said that other provisions of the Voting Rights Act are sufficient to deal with discrimination in voting. This is also not true. Litigation is costly and time-consuming and can only address voting discrimination after it has gone into effect and after the democratic process has been besmirched with the taint of discrimination. Moreover, even the assortment of civil-rights-law organizations that, like my own, are committed to representing voters in such cases could not keep up with litigating the litany of changes that have been unleashed in just the first year after the Shelby County decision. The result is that, for countless voters, discrimination will go un-redressed. The Voting Rights Amendment Act, S. 1945, represents a bipartisan response to the court’s invitation in Shelby County to update the Voting Rights Act. With the discriminatory voting changes we have witnessed in the past year, combined with the many incidents compiled in advance of Shelby County, there is no question that this legislation is vital. To LDF, the VRAA represents a modest and flexible approach to civil rights enforcement that will redress the present-day forms of voting discrimination and will ensure that voters are protected from discrimination anywhere in the country. … It is clear that political entities previously covered by Section 5 have begun to use the Shelby County decision as license to enact discriminatory measures across the full panoply of electoral processes. The record developed thus far indicates that there will be more discrimination to come, particularly as our nation approaches a general election. While LDF and other civil-rights-law organizations are using both litigation and public advocacy to aggressively combat many of the discriminatory changes that have occurred in the absence of Section 5’s enforcement authority, we cannot do it alone. In reauthorizing the Voting Rights Act time and again, successive Congresses have sought to minimize the reliance on expensive, long-term and contentious litigation in our courts to protect the fundamental right to vote and instead have relied upon an administrative enforcement mechanism that is designed to detect discrimination and then prevent it from occurring before it can harm our democratic process. Only Congress has the ultimate authority to enforce the anti-discrimination principle articulated in the 14th and 15th amendments to the Constitution. We urge this Congress to use that exclusive and clearly stated authority to respond to the urgent need occasioned by the court’s decision in Shelby County. Without these vital protections, the very essence of our democracy is at stake. We call upon Congress to move quickly to enact the Voting Rights Amendment Act. Sherrilyn A. Ifill is the president and director-counsel of the NAACP Legal Defense and Educational Fund. LDF represented black voters in Shelby County, Ala., in the case decided by the Supreme Court. Follow her on Twitter.